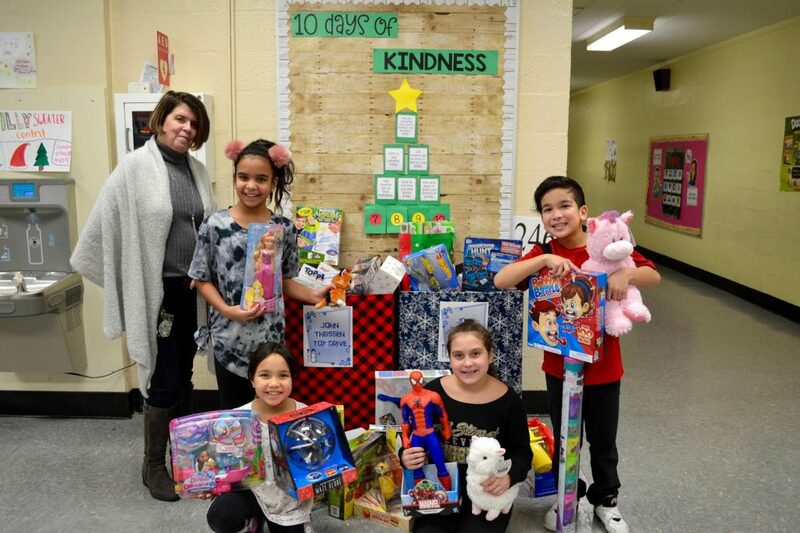 Student council members at Summit Lane Elementary School in the Levittown Public Schools promoted the power of kindness this holiday season by facilitating a toy drive to support the John Theissen Children’s Foundation, a Silly Sweater Contest to raise money for the Kids for Kids Fund at Summit Lane School and a 10 Days of Kindness challenge. Together, students, staff and families donated approximately 300 toys to the John Theissen Children’s Foundation which benefits sick and underprivileged children in hospitals and child-care facilities. Each individual that donated a toy received a paper ornament which they decorated and placed on a tree in the school lobby. Student council members spread the word by creating posters which they placed throughout the hallways, encouraging the student body to give back. For the first time ever, the student council created a Silly Sweater Contest. Staff members were encouraged to bring in their silliest sweaters which were displayed in the school lobby. Students and staff were encouraged to donate $1 to cast their vote on the best sweater. The money raised went towards the school’s Kids for Kids Fund, benefiting Summit Lane students in need. A first and second place winner were awarded and received certificates for their silly sweaters.